astoria | Gluten Free? Gimme Three! One disclaimer is that normally these are not made in a dedicated bakery, so there is a chance for cross-contamination. So, those with extremely sensitive allergies might want to steer clear. Apparently these little babies have been getting some press lately (see Brazilian Cheezy-Poofs on Serious Eats). Around Astoria I know two places that have them, the aptly named New York Pao de Queijo on 31st Ave and 30th St and La Casa del Pan. At New York Pao de Queijo they also have fillings for the bread like catupiri (a soft cheese), ham and cheese, caramel (? ), and guava paste. Plus they have flan and rice pudding for dessert. At La Casa del Pan they have the normal Pao de Queijo and ones that are shaped like bagels, plus arepas and a window display of pre-cooked bacon. In the city I know they have this bread at Big Booty Bread Company and a lot of other places, as chronicled by Always Hungry. I think I’ll have to take a field trip to Churrascaria Plataforma on 49th St. sometime soon. Get these on your table and in your tummy as soon as possible. 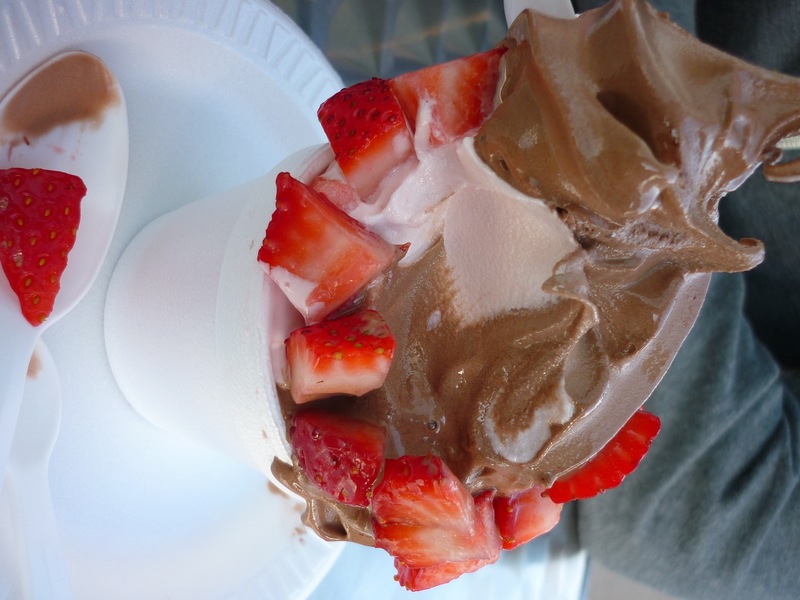 Even though it’s not quite spring yet, it was so nice out today that I got a craving for frozen yogurt. Since there are no TCBY’s in the city, I have been trudging through life without a local fro-yo joint – until now that is. 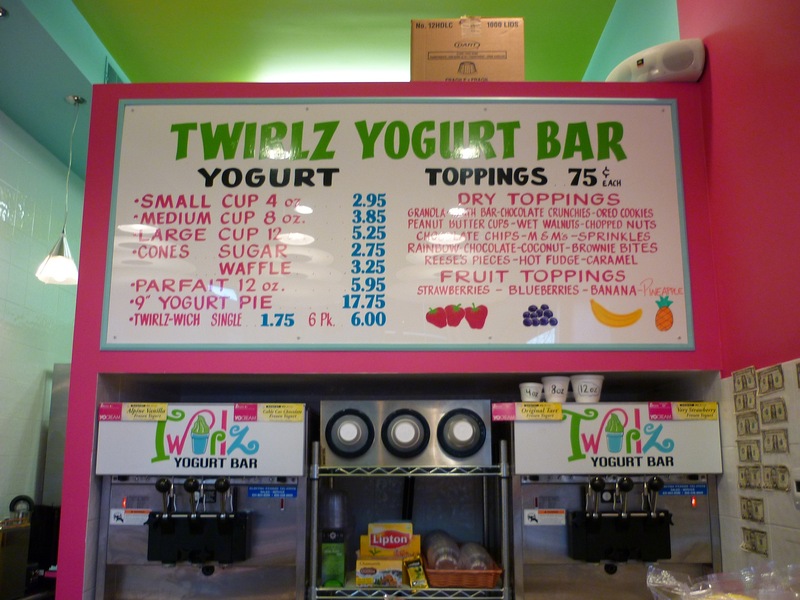 When I was on the bus yesterday I remembered this spot on Astoria Boulevard that I saw once before – Twirlz Yogurt Bar. I love the bright colors in this place, and the fact that they have NORMAL frozen yogurt. They also have the tart variety of yogurt, for those odd people who prefer it, but I like my yogurt sweet and creamy. 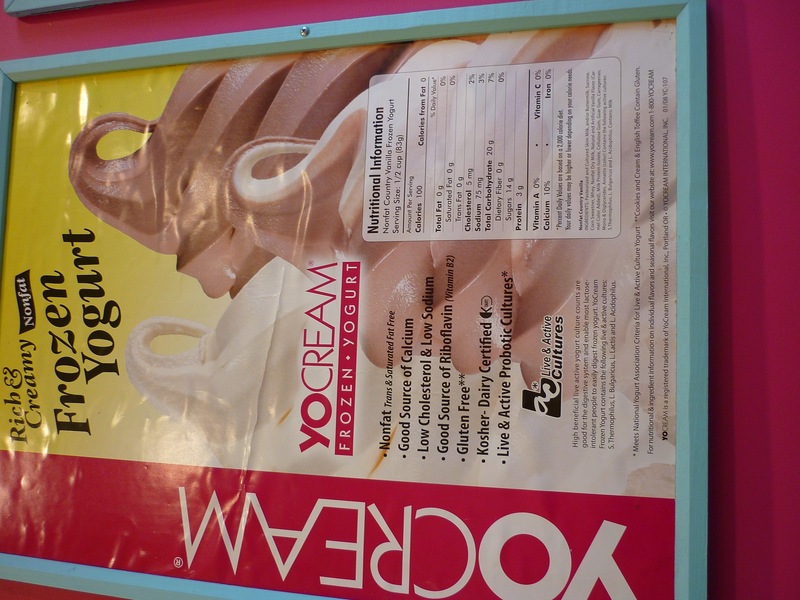 Plus, right on the wall is a giant poster letting you know that all of the yogurt is gluten free, except for the cookies and cream and english toffee flavors. After a free sample, I decided on half strawberry/half chocolate yogurt with fresh strawberries. Little did I know that I would get a veritable Leaning Tower of Pisa of yogurt. It might have been intimidatingly large, but boy was it tasty. I will be back many a time this spring and summer to try all of their rotating flavors. Today Nick and I ventured up to the Astoria Market at the Bohemian Hall Beer Garden, which we only knew had “an eclectic assortment of wares” and some kind of food and drink. Well, it certainly was…something. Basically just an elementary school gym-sized room with about 30 vendor tables. There were weird Christmas decorations, some cool jewelry, art, hand-made cards, and some gluten-free pumpkin chocolate-chip muffins! I believe that the name of the vendor was Elsa-Joy Baked Goods, but I can’t seem to find any information on it anywhere online. Maybe they’ll post about it on their blog soon. Soooo… it was good. The best part was the sticky top and the big, rich chocolate chips. I have been missing the richness of gluten-filled pumpkin bread – like the 440 calorie slice from Starbucks I used to get. I remember it being so dense and filled with moist, pumpkin flavor. 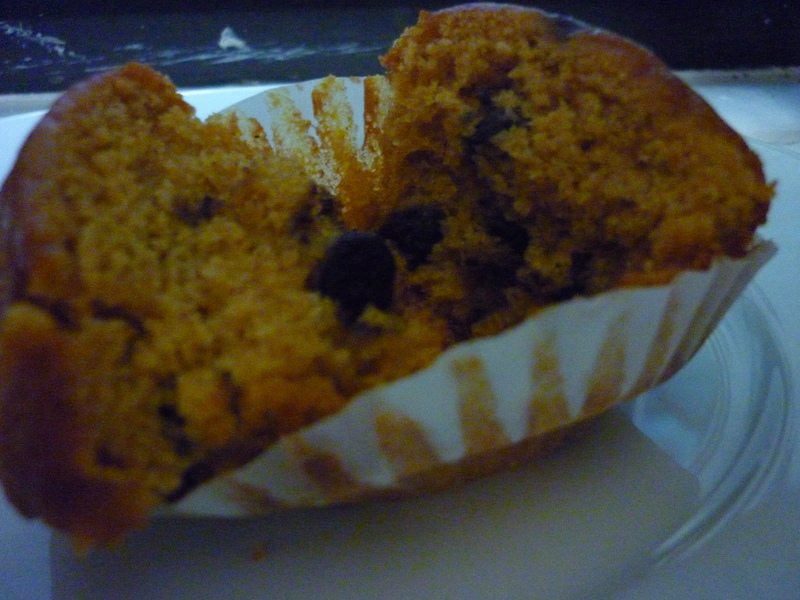 This muffin was a little pumpkin-y, but not like I remembered. I might have to challenge myself to make my own pumpkin bread before autumn is over. Now I’m relaxing, and popped open a St. Peter’s Sorghum Ale. The first time I had this beer was at Peculier Pub on Bleecker Street – and the second time was not the charm. Maybe the first time I had it I was wooed by the cool bottle? For some reason this beer tastes skunked to me. It could be because I’m not used to drinking beer nowadays, but it just isn’t enjoyable for me. I’ll stick with Redbridge from now on. My local natural store in Astoria, Sai Organics, just started carrying a few products from Foods by George. The company is based in Mahwah, NJ, so their products should start showing up in more stores in the area. 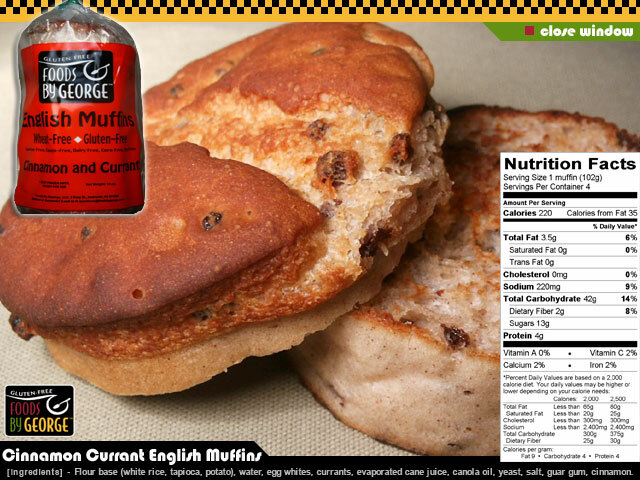 First on my list to try were the Cinnamon and Current English Muffins. First of all, I was stunned by the low calorie count in these babies – only 220 for a HUGE muffin. This thing is like two hockey pucks stuck together – only much more delicious and less hard and plastic. They were $5.49 for four muffins, but sooooooo worth it! They have the exact texture of English muffins, only BIGGER! I’m sure these would be pretty simple to make, because they only have a few ingredients, but it’s the guar gum that gives them that great chewy bite. I made some honey cinnamon butter and slathered it on a toasted muffin. (2 T softened butter, 2 T honey, 1 tsp cinnamon). I also tried one with peanut butter, and one with normal butter, and I’m thinking of putting cream cheese on the last one I have. Sai Organics also started carrying their little personal-pan pizzas and pizza crusts. I hope they get the crumb cake in though. 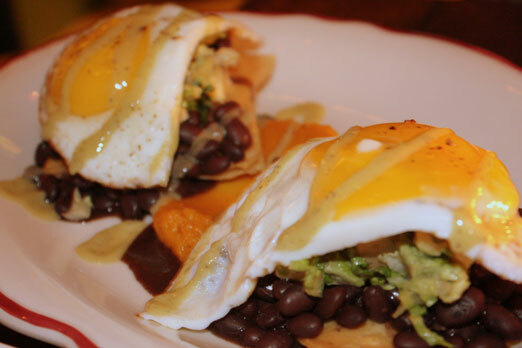 I decided to start blogging about my Astoria-specific dining experiences on Why Leave Astoria? 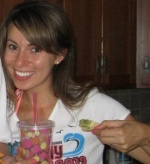 You can go to their website for my review and lots of other cool information on what goes on in my neighborhood!